This page will remain for archival purposes, however, the new Super Zappicator has a number of improvements and we no longer stock or sell the older Food Zappicators. We are now selling the Food Zappicator, as described by Dr. Hulda Clark in her latest edition of “The Cure for HIV and AIDS,” page 244. It is a high quality plastic case with two specially selected magnetic speakers inside, wired to ensure correct North polarization when hooked up to the Auto-Zap zapper as shown at the bottom of this page. You will need a Zapper to power the Food Zappicator. The zappicator adds destructive power to the previous two devices. Not only can PCBs, asbestos and benzene be destroyed but a whole host of toxic molecules. A big advantage has been gained from electrical treatments. All parasite eggs and stages can be killed quickly, and to any depth, by any one of the three methods [sonicator, food zapper, and food zappicator]. You can now cook, bake, poach or fry them the usual way. Do not grill. Most are sprayed with combinations of wax, dye, pesticide, antisprouter, antimold, etc. Azo dyes (Fast Green and Fast Garnet) are present in most sprays, as are lanthanide metals. They penetrate the food deeply. But double soaking in hot water for one minute removes it. Even organic bananas, pears, plums and grapefruit must be double soaked this way. Peeling is not sufficient. Then zappicate them to destroy food phenolic chemicals, parasite filth and leftover traces of sprays. Always zappicate the final product unless you know each item has already been treated. We test each Auto-Zappicator to ensure that it has the correct polarization specified by Dr. Clark, and cover it with a 5 year parts and labor warranty. 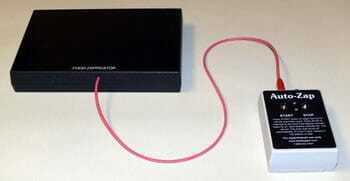 You can easily test the polarity yourself, as Dr. Clark recommends, using any ordinary magnetic compass. 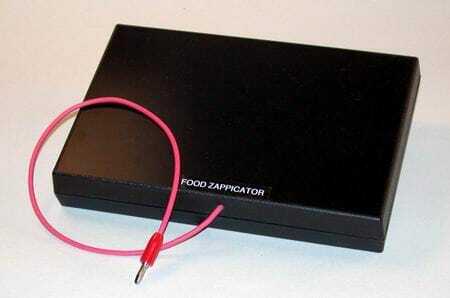 NOTE: the Food Zappicator requires a Zapper to power it.